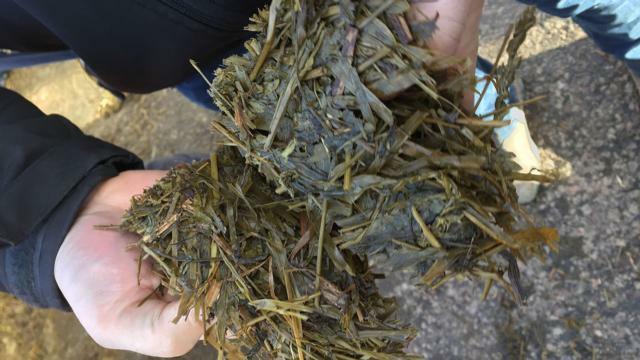 Use of herbal leys within an integrated farming system could enable farmers to reduce input expenditure and improve soil health, visitors to an Agricology field day at Daylesford Farm in Oxfordshire heard. Abby Kellett reports. Whether in an organic or conventional system, the use of herbal leys can prove beneficial for crops as well as livestock it is claimed – whether used to build soil fertility, to control weeds or to provide alternative income by leasing land for grazing. The diverse growth habits associated with herbal leys have several benefits within arable systems. For example, the different rooting systems allow greater uptake of nutrients, meaning less reliance on nutritional inputs. Equally, a wide range of growth habits above ground can aid weed suppression – particularly useful where black-grass is a concern. Since most herbal leys include a proportion of leguminous species, there is also an opportunity to fix large amounts of nitrogen. 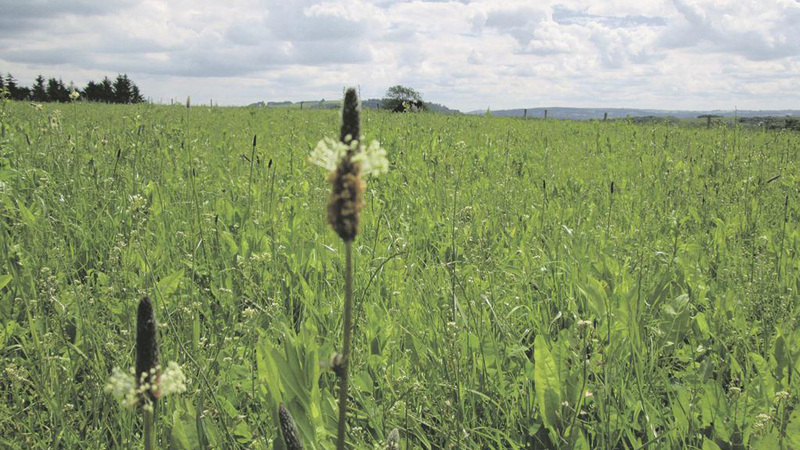 However, since herbal leys do not provide a direct form of income, unless grazed, there is often a need to minimise the length of the ley, but while still maximising the benefits associated with it, according to Alistair Leake, director of policy at the Allerton Project. Agricology is community of farmers and researchers sharing knowledge about how to achieve more resource efficient, resilient and profitable agricultural systems. It is led by the Game and Wildlife Trust, The Daylesford Foundation and the Organic Research Centre. Speaking at the event, he said: “One of the great ways to minimise the fertility building period is to undersow the ley in the spring. At the Allerton Project, we have managed to reduce the length of the ley to 18 months and have then managed to grow an 8t/ha crop of wheat after it. “You typically need around 23kg of nitrogen for every tonne of wheat produced, so in 18 months we were able to produce over 200kg of plant fixed nitrogen in that system. What is a herbal ley? Herbal leys typically contain deep-rooting grasses, nitrogen fixing legumes and medicinal herbs. They can contain as many as 17 species, all with varying characteristics. See also: Which public goods should farmers and landowners be paid for? In trialling four different herbal ley mixtures, Tom Willoughby of Grange Farm, Leicestershire has discovered several differences in crop performance, both above and below ground (see table). He found that while a multispecies ley, which included 10 species in total, failed to produce the highest yield, the number of different types of rooting systems within it meant it boasted the highest root density and the joint highest root depth. Its higher seed price can be partly justified by the longevity of the ley, according to Mr Willoughby. The top yield came from the red clover mix, which produced 15t/ha (6t/acre) of dry matter. “Where there was the highest level of root activity, in the multispecies ley, there was also the highest worm populations – so the overall soil biology was better,” he said. Of the species that have been trialled at Daylesford Farm, sainfoin proved one of the most successful on the light Cotswold brash soil that runs through large areas of the farm. However, depending on the season, often sainfoin does not fully establish until the second year warned farm manager, Richard Smith. He said: “In the first year sainfoin can be very slow to establish and so we tend to grow it with some native grasses in order to make sure the ley remains competitive against weeds in the first year. However in the second year, the sainfoin becomes a great weed suppressant and typically produces around 37t/ha of fresh weight silage, at around 22 per cent crude protein and an ME that is off the scale, and so it is an ideal forage for fattening livestock. “It is very drought resistant and once established, the roots can go down to around 20ft, which makes it great for scavenging nutrients. While it can be established on most soil types, it prefers light and non-acidic soils, he added.